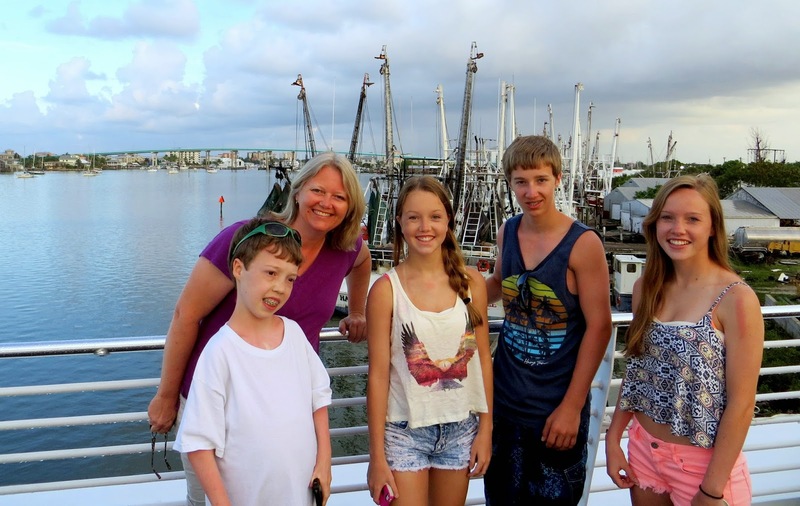 On the second to last day of our vacation, we thought it would be fun to take a quick trip from Fort Myers to Key West, Florida aboard the Key West Express. We woke up bright and early to get there before everyone else so we could have seats for the 4 hour trip. Glad we did because there was a full load of people going to Key West for the 4th of July weekend. We weren't sure which seats to choose, but thought this one with the table would be nice. Until we realized we were in direct contact with the sun for the majority of the trip. Add to the sunburns. The kids and I spent a lot of time on the trip playing card games like Golf and Texas Hold 'Em. I'm glad we don't play for money because them kids are getting pretty good. We spent some time out on the decks, but it was loud, hot, and windy so we'd usually go in after 10-15 minutes. We arrived at Key West around noon, ate at Turtle Kraals, and then suddenly realized we only had about 4 hours until we had to go back on the boat. We didn't do a great job of planning our time in advance, so we had to wing it to be sure to have fun in the short time we were there. Suddenly I realized we were walking on the boardwalk and right next to us in the water were some monster fish. They're called tarpon and they are HUGE! And vicious. Somebody threw in a treat for them and these things were on it like a dog on a bone. I could have watched these guys all day. My sister's family wanted to explore the island in the time we had left while we decided to go to the Key West Aquarium instead. I had never been to an open ocean aquarium, so it was really cool to see the shark enclosure. I've never seen a wild shark before, but this was pretty close. They had a section of the beach closed off with boards and fences so the sharks are contained in what would otherwise be their natural habitat. The lady said they get fed 4-5 times per day so they're pretty happy there. As a matter of fact, a few years ago a hurricane came through and destroyed the cages. The sharks decided to stay there rather than escape and be out in the wild again. They recognize a good thing when they see it. The aquarium hosts a lot of rescued animals including this turtle who had his flipper chewed off by another animal when he was just a little guy. I could really relate with this turtle. This aquarium has been open since the 1930's and many of the exhibits are still in their original form. Which is why you can almost trip into a large tank full of sand sharks. I'd always assumed sand sharks were relatively harmless, but the lady said they have a whole bunch of tiny razor sharp teeth. She said putting your hand in their mouth would be like putting it in a paper shredder. Which doesn't sound that much fun. They had lots of different animals as well like this big horseshoe crab. He had feet like a big spider. The conch was pretty slimy when he made his way out of his shell. It looks like a big nose being blown. And of course in Florida, you gotta have gators. This one looked pretty friendly.